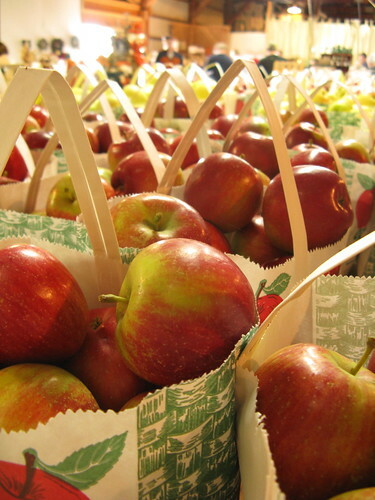 When it comes to apple season we are lucky to live in Minnesota, especially the Twin Cities area. So many wonderful varieties of apples are grown here and, thanks to the University of Minnesota, so many varieties are also developed here. They developed the very popular Honeycrisp & this year's starlet, the Sweet Tango. We like to go out to the University's Apple House to get our apples each fall. Not only do they have all the typical favorites but you can also try new varieties they are working on that don't even have names yet, just a number & flavor profile identify them. Maybe one of these will be the next big apple star. 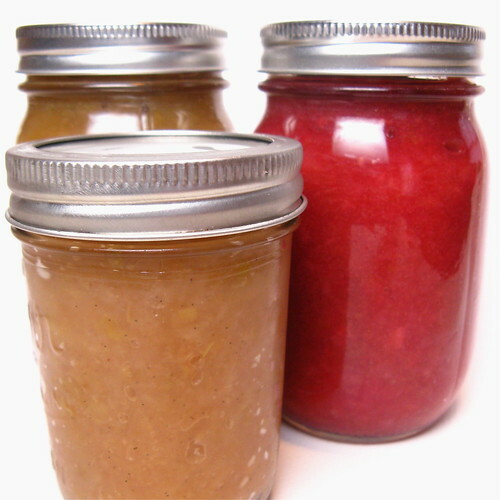 A lot of varieties of apples will last through the winter in your fridge but we also like to make some into applesauce. Last year we made two flavors, Ginger Peach and Pomegranate. We experimented with three new flavors for this year, Raspberry, Chai, and Vanilla. All of them turned out really delicious. The Vanilla is the most basic of the flavors but the use of fresh vanilla makes it special (& like good vanilla ice cream it has flecks of vanilla seeds in it). The Chai has a lot of nice spice flavor to it. The Raspberry was really the star in my book with is beautiful color & sweet/tart flavor. I'm so glad I froze fresh raspberries this summer for this purpose. A word about buying apples for making applesauce - If you buy your apples at an orchard don't bother paying for the 1st quality apples for making sauce, save those for eating. For this applesauce we bought a bag of what are called Utility apples which ran $4.50 for a peck. These apples aren't going to win any beauty contests but are perfect for making sauce. The variety we used was Fireside. In a large heavy pot add the water, sugar & raspberries. Bring to a boil. Stir to dissolve sugar & break down raspberries a bit. Turn off heat & let sit about 10 minutes. Strain through a sieve to remove seeds. Return raspberry mixture to the pot. In a large heavy pot add the water, sugar & tea bags. Bring to a boil & stir to dissolve sugar. Turn off heat & let sit about 10 minutes. Remove tea bags , squeezing any liquid in them into the pot. 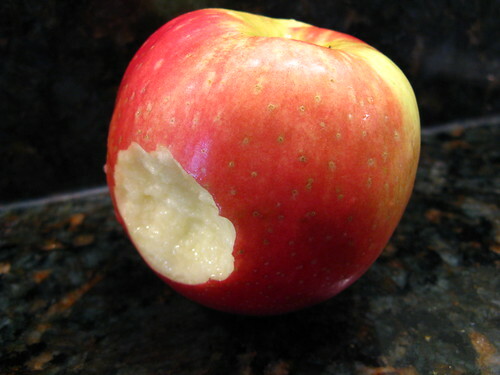 Cut the prepared apples into slices & add to the pot with your flavoring mixture. Turn the heat to medium-high. Let cook, stirring occasionally, until the apples are very soft about 30 minutes. Use a spoon or potato masher to help smash the apples to a sauce texture. (If you left the skins on your apples run your sauce through a food mill at this point to remove them.) Stir in the lemon juice. If your sauce seems too thick for your liking add a little water to it. At this point the sauce can be put into containers & refrigerated. Or you can put hot sauce into sterilized jars & can them in a boiling water bath for 20 minutes for pantry storage. I did mention a giveaway in the title of this post didn't I? Not too long ago I had run out of fresh vanilla beans & was looking for an online source to buy it. I hadn't been happy with the quality of the beans I'd been getting in the spice aisle of the grocery store not to mention the price. That's when I was contacted by the folks at Singing Dog Vanilla. They offered to send me a sample of one of their products to try & I jumped at the chance to try the vanilla beans. Their beans are organic & they offer two different varieties. These were so different than what you get at the grocery store, soft, plump & oh the smell when you open the bag is heavenly. They added amazing flavor to my Vanilla Applesauce. They also wanted to offered one of my readers a chance to try one of their products. Visit their website & then comment on this post letting me know which item you would be most interested in trying; vanilla beans, vanilla paste, vanilla extract, coffee, cinnamon sticks or ground cinnamon. I'll pick a winner on Friday, November 13th (oh scary!) & that winner will get their ingredient of choice. Don't forget to leave an email address in your comment where I can contact you if you win. Your applesauce looks amazing! Thanks for posting the info on the vanilla beans. My selection where I am at are just not that great. It's nice to have alternatives. I would love to try some of the beans also. I could always use some ground cinnamon - it's not that easy to find around here! Kat, thanks for sharing! Homemade applesauce reminds me of my great-grandma who was a superb canner (a trait I have yet to master). I think it's exciting that you get to try new varieties of apples! How neat to be so close to the development of new hybrids. I was pleasantly surprised to discover honey crisps only two years ago, and since it has become my favorite! We make low-tech applesauce around here--nothing but apples! But the raspberry sounds fabulous and I think my family would probably enjoy peach as well. Those vanilla beans looks great! Thanks for the chance at your giveaway. Love your site, and have finally started trying some of your recipies - at least parts of them integrated into my own creations:) I'd like to try the vanilla beans, please. mmm. honeycrisp is my new favorite apple. mmm. chai spices in sweet applesauce sounds amazing. Started following your blog recently. Love the recipes on here! Thanks for the advice on the apples, there's an orchard close to here and now I know what to ask for. The vanilla beans would be a wonderful addition to my pantry. I love the flecks of vanilla in sugar, ice cream, etc. Nothing like apple sauce in the autumn, is there? We've been making roasted apple sauce at our house. Love the way the flavors concentrate! So much natural sweetness there, you don't even need sugar. As for the giveawy -- how fun. And Oh, yum! That vanilla bean paste would be fabulous. We're making pear sauce here. As for the vanilla, it's hard to say. I make our own vanilla extract and sugar, so the vanilla beans are the most useful for that, but I am intrigued by the vanilla paste. Your applesauce looks great! I agree...we are pretty lucky to live here in mn! I would really like to try the vanilla bean paste! I've read so much about the Sweet Tango. Can't wait to try it! kat... the applesauce base is excellent and neat that one can incorporate different flavors into it. There is nothing better than homemade apple sauce. Thanks for this recipe. I looked at Singing Dog Vanilla's website and I would love to try their PURE VANILLA EXTRACT. It is something that I use a lot (well really only use pure). Sounds like they have some great products. Thanks for the giveaway! I would like to try the vanilla paste. Thanks for all your recipes and ideas, Kat and Matt. I am excited to make some raspberry applesauce with some fresh frozen raspberries still in my freezer. I've never cooked with fresh vanilla beans before but I would love to try it out with some of Singing Dog's Gourmet Vanilla Beans. Thanks for the opportunity! i had a huge surplus of apples from the orchard earlier this fall - okay, so my eyes got the best of me. how can you say no to 10 pounds for $5? needless to say, i made the vanilla applesauce tonight! it's in a little bowl right next to my computer right now! it is to DIE for! i am a huge vanilla fiend; i put it in everything. i love beans and buy them constantly. i've had good luck with penzey's and i like their airtight tube they come in but they are incredibly expensive. if these internet beans are as wonderful as you say they are, i'd LOOOOOVE to try them! I just finished the last of my homemade applesauce but now I want to make more and flavor it. Thanks for all the flavors. I would go for the Vanilla Bean Paste. I love that stuff. Your applesauce looks great. Thanks for the link. Can't have enough shopping links. Vanilla Paste!! I've never tried that before! Vanilla extract. I've been using Nielsen-Massey Madagascar Vanilla and really like it. If they last that long, I think I'll make some applesauce. Getting tired of apple-flavoured desserts. Really like the raspberry recipe -- they're just so expensive now. I'm so excited that you shared your applesauce recipe. My sister is going to spend the weekend with me, and she wanted to do some baking/cooking while she's here. I think we'll definitely look into making some homemade applesauce - especially the raspberry. Mmmm. I looked at the different products, too, and I'm really intersted in the vanilla paste. Holiday cupcakes with vanilla buttercream? Maybe. I can't believe I've never made my own applesauce. I bet it would be great with the vanilla bean paste. I've been reading your blog since I followed a link to it last summer from the Harmony Valley CSA site. It's fun to read especially when I was getting the same veggies you were--often when I needed ideas on what to do with the stuff in the CSA box, I checked to see what you did with it(unfortunately I wasn't able to join the CSA in 2009, so it wasn't as easy this year). I've tried some of your non-CSA recipes,too, and the Coconut-Lime Cupcakes were such a hit here that I made them (plus one other kind) for my daughter's wedding this past May! I'm glad you re-mentioned the pomegrante applesauce - I still have some juice in my fridge and I keep wondering what I'm going to do with it. The applesauce looks wonderful. I am planning on getting some honeycrisp this week myself. You are lucky to live so near where they develop types of apples! I would love to try the Vanilla beans; I've not cooked with any but would love to give it a try. Hi, long-time lurker finally lured by the giveaway. Thank you for always having such delicious, fresh ideas for meals on here. Anyway, I'd love some beans if I'm chosen. K_E_Kennedy [at] yahoo ... well, you know the rest. Oh my gosh, I would love to try the Vanilla Bean Paste! What an easy way to add real vanilla to recipes! So glad you retweeted this. One, because I missed your applesauce recipe post! They all sound so great. Two, because I would love to try out that vanilla bean paste. Although I can't say I'd be opposed to any of the items. They look wonderful. I'm jealous of all the wonderful apples up there, but central KY isn't doing too badly in that area. We have a couple great orchards here that I love come October.